Ryan was born in Los Angeles. His home congregation is Messiah Lutheran Church, La Crescent, Minn. He graduated from Concordia University, St. Paul, St. Paul, Minn., with a bachelor’s degree in theology and world languages. He received his Master of Divinity from Concordia Theological Seminary, Fort Wayne, Ind. 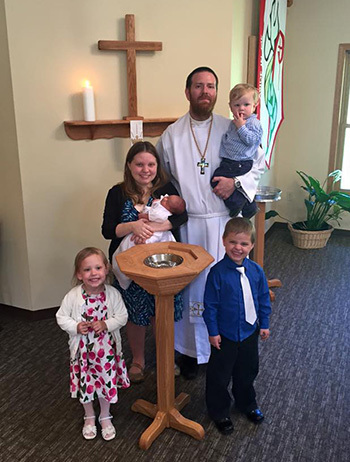 Before becoming a missionary, Ryan served as a pastor at St. Peter Lutheran Church, Elma, Iowa. Ryan’s hobbies include reading, cooking, home brewing beer, geocaching and spending time with his family. Please pray for Ryan and Emily as they serve in Ghana. Pray God gives them strength and peace as they transition to life overseas, learning the culture and the language. Pray God gives Ryan and Emily wisdom and patience as they help their children adjust. Pray that the Holy Spirit leads and guides them to do the ministry work set before them with joy in the Gospel. Pray the hearts of people here in the United States are moved to pray for and to financially support the McDermotts so they can “go with” this family on this journey of faith. Let us give thanks to God that Ryan and Emily answered the call to serve in Ghana, West Africa.